For more than two years, senior police and intelligence officials and senior cabinet members have been warning that terrorists will attack the UK and the likely target is London. Below are basic details of all of the police operations relating to terrorism known in Britain since January 2003. All of the names of those arrested have been removed. 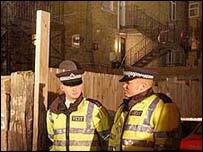 2003 January 5: UK police find deadly poison ricin in a London flat. Seven North Africans were arrested. January 11/12: There were six arrests in Bournemouth, in connection with Ricin, including an unnamed 17-year-old. January 22: A 31-year-old man was arrested and charged with conspiring to develop or produce a chemical weapon. Seven others are charged with offences related developing or produce a chemical weapon contrary to section one of the Criminal Law act 1977. January 29: Four arrests were made in Manchester. The four, aged 30, 32, 35 and 31, were taken to London for questioning. Two of the arrests were made in the Manchester suburb of Hume, the third in Bury and the fourth, later in the morning, in Stretford. February 6: Two men in Edinburgh, two men in London, one man in Greater Manchester, and a man and woman in Glasgow were detained under the Terrorism Act 2000. 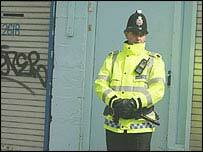 The arrests were linked to the arrest of seven men in Edinburgh and London in December 2002. 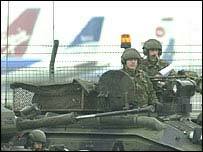 February 11: Troops deployed at Heathrow Airport amid intelligence that Islamists with links to al-Qaeda have smuggled portable anti-aircraft missiles into Britain. Investigators were told that the smugglers then contacted a small number of known sympathisers in the UK who have become the focus of a huge police inquiry. February 13: Two men were arrested in Hounslow, west London under the Terrorism Act 2000. They were released without charge. Meanwhile, a 37-year-old Venezuelan national, was arrested at Gatwick Airport, after a live hand grenade was allegedly found in his luggage. February 16: Head of the Metropolitan Police, John Stevens, told the BBC that al-Qaeda cells were active in Britain. He said it was difficult to say how many cells were active. "We do know there is a substantial presence, and we are taking action", he said. March 11:	Lord Carlile tells Home Affairs Select Committee that 'enemies within' could be planning an attack on the UK similar to the Bali bombing. March 18:	Three men were arrested under anti-terrorism laws in Crawley, near Gatwick airport, London, and two home-made bombs were found in a flat in the Langley Green area of Crawley. March 27:	Eight men were arrested under the Terrorism Act in Derby. All of the men, in their 20's and of Middle Eastern origin were taken to a police station in Derbyshire for questioning. The arrests were part of an ongoing operation and it is confirmed that officers from the Metropolitan, South Yorks and Humberside police were involved. April 1: Two illegal immigrants from Algeria were found guilty at Leicester Crown Court, of trying to raise money for al-Qaeda. They are the first people in Britain to be found guilty of being part of the al Qaeda network. 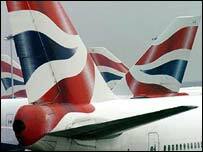 August 13: BA halts flights to Saudi Arabia after "credible intelligence of a series of threats to UK aviation interests in Saudi Arabia". November 20:	Istanbul, Turkey. Explosions outside the British consulate and the HSBC kill at least 26 people - including Roger Short, the British Consul - and injure more than 450 others. November 27: A 24-year-old man is arrested in Gloucester, on suspicion of having links with al-Qaeda. He was charged on December 3 with conspiring with 'shoe bomber' Richard Reid. December 2: Four men aged between 23 and 26 are arrested in pre-dawn raids across England. They were later charged with obtaining and possessing money to fund terrorism or possessing articles or material which provide instruction or training to make firearms or explosives,". Two of those charged were residents of Dudley, while the other two were living in Luton. March 30: Hanwell, West London. Eight people are arrested after a ton of fertiliser is found. The suspects had been under surveillance for several weeks. The seven, including one juvenile, were charged under the Explosive Substances Act 1883. April 6: Intelligence agents in the UK and US foiled an alleged chemical bomb plot in Britain which was believed to involve detonating a combination of explosive and a chemical called osmium tetroxide. The plotters were thought to be sympathetic to the aims of al-Qaeda and the intended target was believed to be British civilians, probably in London. April 19: 10 people were arrested in a series of dawn raids in Manchester as police smash a suspected Islamic terror plot to bomb a target in Greater Manchester. Three were released without charge, and six were released under the Terrorism Act but rearrested and bailed for other offences, including immigration issues. April 20: A security alert was triggered when an asylum seeker was found in a London Underground tunnel. The Iraqi national was found in a tunnel between Seven Sisters and Finsbury Park on the Victoria Line. The tracks were searched and the man was released without charge after being questioned by police.